Our team can help homeowners and general contractors in Columbus pick out the perfect style and color of quartz kitchen countertops. There are lots of kitchen countertop options out there today – from tile, laminate, travertine or wood, to concrete, glass and stainless steel. So, how do you know which is best? Well, we’d like you to consider quartz. Why choose quartz kitchen countertops or bathroom vanities? The short answer is that quartz is one of the most beautiful, hygienic and strongest options on the market. As durable and strong as granite countertops are, quartz is even stronger. In fact, quartz is one of the toughest materials on earth; one of the few things that is tougher than quartz is a diamond. Also, quartz is versatile and available in a limitless range of colors, allowing it to easily adapt to your home décor. What’s more, it’s resistant to bacteria and easy to clean. Another advantage is that quartz is stain-resistant because of its non-porous surface. Olive oil, coffee and even your Cabernet will merely sit on the surface, ready for a sponge, without soaking in. Because quartz kitchen countertops are non-porous, they don’t need to be treated or sealed. Many other surfaces, such as limestone, marble and granite, need to be sealed regularly. Quartz is maintenance-free and ready to go right out of the gate! 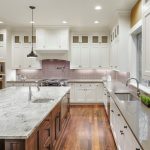 At The Granite Guy, our team can help homeowners and general contractors in Columbus, Ohio pick out the perfect style and color of quartz kitchen countertops. We’ll help you add beauty and value to your home in an affordable and simple way. Contact us today for a free estimate on quality countertops!